Located directly across the street from Chelsea Market (formerly the Nabisco factory -- birthplace of the Oreo! ), which is a favorite destination for professional chefs and home cooks alike, not to mention home to the broadcasting complex where such notable shows as Food Network's Iron Chef America and Emeril Live are filmed, Colicchio & Sons is in perfect company. It acts as the anchor of an eight-block restaurant row, where such notables as Mario Batali and Joe Bastianich's Del Posto and "Iron Chef" Masaharu Morimoto's Morimoto grace the neighborhood. The neighborhood itself is rich in history, not only because it's the birthplace of the Oreo cookie, but also because it houses the High Line, a 1.5-mile elevated railroad that's currently being restored. 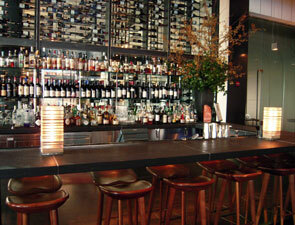 So, after picking up some spices at the Chelsea Market, why not stop by Colicchio & Sons for dinner on your way home? After you enter through Colicchio & Sons's large, two-story glass door, you'll be amazed by the floor-to-ceiling windows and the immense airy space. You'll have to walk up a few steps to the reception area, or -- if you've got weak knees -- take the lift that's directly to the right as you enter. At the top of the stairs and the lift is the Tap Room. Not only is this space large and airy, but it's also available for casual dining, in case you'd rather not have dinner in the formal dining room. Oversized windows provide a view of the High Line and of Chelsea Market and are decorated with diaphanous draperies and shades so that the sun needn't spoil your meal. Dark wood tables and curvilinear red chairs provide plenty of dining comfort. 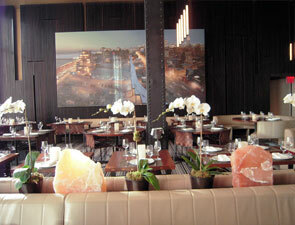 There's also rich leather banquette seating, if you're simply sitting with a drink. The area is separated from the reception check-in desk by a number of large leafy green plants. Dark wood floors covered with area rugs and a woven ceiling help keep the noise level down. Separating this lounge from the main dining room are the bar and the wall of wine, which we describe later in our Appealing Highlights section.